We do love a good co-op beat em' up game. Soon PlayStation 3 owners will get a new game, with a classic taste called Revenge of the Wounded Dragons. 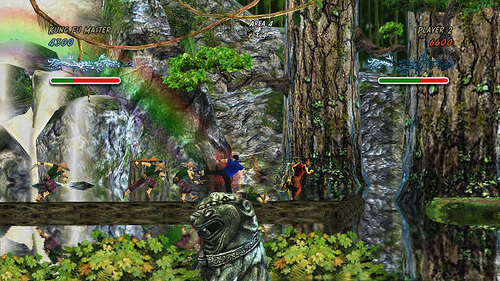 Taking inspiration from titles like Double Dragon, the kung-fu title supports 2 player local co-op play. Being developed by Wanako Games, who have also made the excellent Assault Heroes 1 and 2, you'll be challenged with 24 levels, 10 mini games, and tons of special moves. Wounded Dragons even promises co-op specific special moves. While the entire story is playable in co-op, there will be times you'll be forced to face off against your partner in true Double Dragon style. We're reminded a bit of Invincible Tiger when looking at this, but I guess we'll see what Wounded Dragons offers when it releases "soon." Page created in 0.8993 seconds.